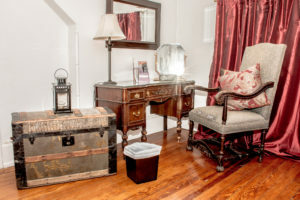 Named after General Harry C. Trexler and Captain Nolan P. Benner, the two legendary Allentown leaders connected to this historic property, The Historic Benner Mansion currently offers three options for your accommodation pleasure: The General Harry C. Trexler Quarters, The Captain Nolan P. Benner Suite and The Coco Benner Atelier – named after Captain Benner’s daughter, the late Bette “Coco” Garretson. 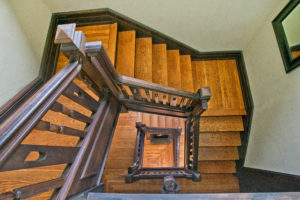 All returning guests receive 20% lifetime off all future stays reserved through our website www.historicbennermansion.com as members of our Historic Benner Mansion Guest Family. We accept all credit and debit cards and as long a you provide one week notice – no charge for cancellations. Spacious Queen sized four poster Bedroom, Dressing Room and Bathroom – sleeps four with two of Historic Benner Mansion comfortable cots! 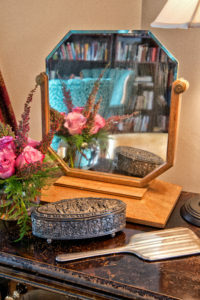 This second floor, spacious room has a queen-sized four-poster bed with new premium mattress, a wall of bookcases filled with relaxing reading material, dresser and desk, dressing room with huge closet, large bathroom with bath and shower, flat-screen television with complimentary full cable, complimentary wireless Internet and more! The room is replete with historic items belonging to Captain Nolan P. Benner’s family that were donated by their descendants to The Historic Benner Mansion. PERFECT for families! 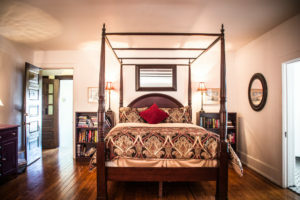 Two Bedrooms: One huge Queen sized four poster bedroom, one regular bedroom, a SHARED very large bathroom – sleeps up to six guests with two of our Historic Benner Mansion comfortable folding beds. This expansive third floor private retreat comes with two bedrooms and a shared HUGE bathroom – one expansive bedroom and down the hall a “regular” sized bedroom, each with new premium queen-size mattresses, flat-screen TVs with full complimentary cable channels, antique desk and seating area plus complimentary wireless – sharing a huge bathroom with old fashioned clawfoot tub and shower (perfect for families comfortable with walking through large bedroom to bathroom). There is plenty of room for our Historic Benner Mansion folding beds if you have extra family members! The room is replete with historic items belonging to Captain Nolan P. Benner’s family that were donated by their descendants to The Historic Benner Mansion. 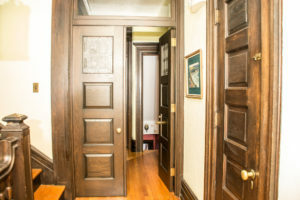 Spacious two bedroom Suite with SHARED 1914 original bathroom and queen sized beds with original electric busbar box and dumbwaiter – sleeps six with two of Historic Benner Mansion comfortable cots! 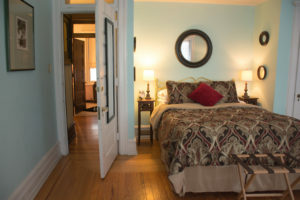 This second floor, spacious Suite has two roomy bedrooms with queen-sized beds each with new premium mattresses plus original 1914 bathroom with bath and shower, flat-screen television with complimentary full cable, complimentary wireless Internet and more! 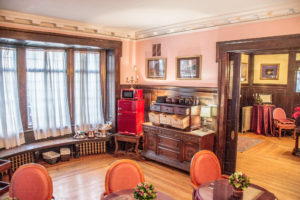 The room is replete with historic items belonging to Captain Nolan P. Benner’s family that were donated by their descendants to The Historic Benner Mansion. 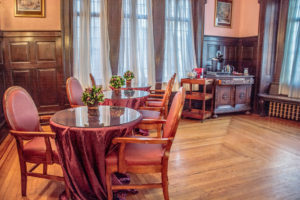 As your Innkeepers we are happy to arrange restaurant and other reservations; vehicle parking; and accommodate executive, trustee, bride and student needs — just ask! 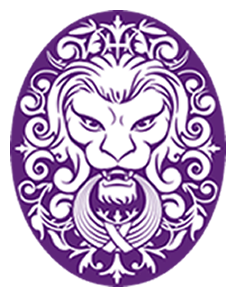 With our almost thirty years living in the wonderful city of Allentown – we have a wealth of experience and contacts to assist you! As members of our Historic Benner Mansion family, our guests are encouraged to join us the first Saturday of every January for our Annual Historic Benner Mansion Holiday Party – in its 29th year in 2018 — a great way to kick off the holiday season! As of the Mansion’s 104th birthday in 2018 and a Bed & Breakfast since 2008 — we’ve had the honor to serve 2000 guests from thirty states and two countries. We look forward to having your family be the newest member of our growing Historic Benner Mansion family.